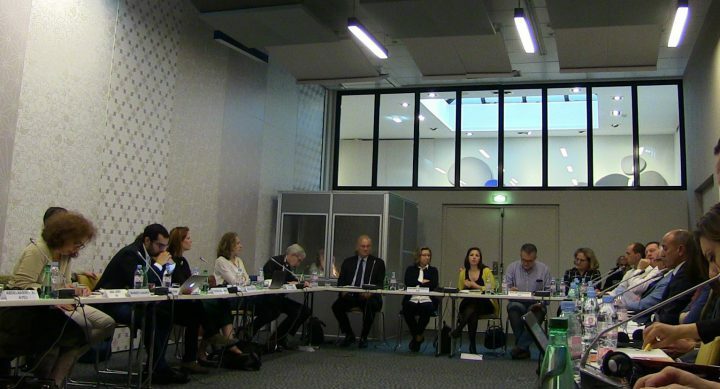 Paris – Over 25 experts in security in the Middle East and representatives of donor organizations met in Paris last Friday to discuss the way forward from the fragmentation witnessed by the security and political orders in the region’s countries in conflict. The workshop was organized by the Arab Reform Initiative (ARI) following the launch of the e-book, Out of the Inferno?, on ways to stabilize and bring security back to Iraq, Libya, Syria, and Yemen as part of its wider project on “Rebuilding Security in Fragmented Societies”. Drawing on earlier work by ARI on Arab “securitocracies” and transitions, this project analyses the governance and behaviour of security institutions, the link between security and politics, and the basis on which these institutions can be rebuilt in post-conflict transition. During the one-day meeting, experts sought answers to questions on the fragmentation of the central security systems, the implications of the emergence of local security arrangements, the multiple players involved, and new avenues for the rebuilding of security in Iraq, Libya, Syria and Yemen. Participants also discussed the role regional actors play as a hindering or enabling force in the rebuilding of security and their interest in doing so. They examined the extent to which societies in the region can develop a vision and capacity to construct home-grown security systems and through which processes. The discussion emphasized the importance of developing coherent national frameworks for the construction of more inclusive security structures and the need to consider militias and armed groups as full actors with important leverage during any political negotiations. While the notion of sequencing security and political arrangements was seen as crucial, it was felt that it needed further deconstruction in order for these arrangements to become mutually reinforcing and to set up schemes allowing for political arrangements to emerge. Such arrangements, including the organization of the state, namely the question of decentralization or federalism, remain central to any future attempts to rebuild security in the Middle East.